It might surprise you to hear that there are more types of paper available on the market today than there ever have been in the past. Paper is no longer just something to write on, an afterthought after pen and ink have been decided upon. Choosing the right fountain pen paper is a balance of many different things, including how you want your writing to look, how you want the reading and writing experience to feel and how much money you want to spend. In this article I want to cover these important considerations that should help you to choose the right fountain pen paper. Good paper can help bring out the finest qualities of your ink and make your writing look much more interesting. On the flip side, poor paper can bleed and feather, which will obviously make your writing look bad. So how can paper improve the look of your writing? The main way is that good paper will accentuate any sheen or shading properties that your ink might have, as well as improve color saturation. High quality fountain pen paper is also typically smoother than cheap paper, which means your nib will glide across it while you write, which has the potential to improve your handwriting. Take a look at the two following images. The first shows a writing sample that was done on generic copy paper. While it’s not hard to read the words, the ink has feathered and looks somewhat boring, especially when compared to the second image. In the second image, you can see that the writing has more dramatic shading, intense color and also hasn’t feathered at all. Which one would you rather your writing look like? Copy Paper: You can see how little shading there is in the writing, as well as how soft it looks. Tomoe River: You can see how much more shading and saturation the ink has, as well as being much more crisp and defined. Another thing to consider when choosing paper for your fountain pens is what you want the reading and writing experience to be like. Quality paper should be both wonderful to write on and to hold. 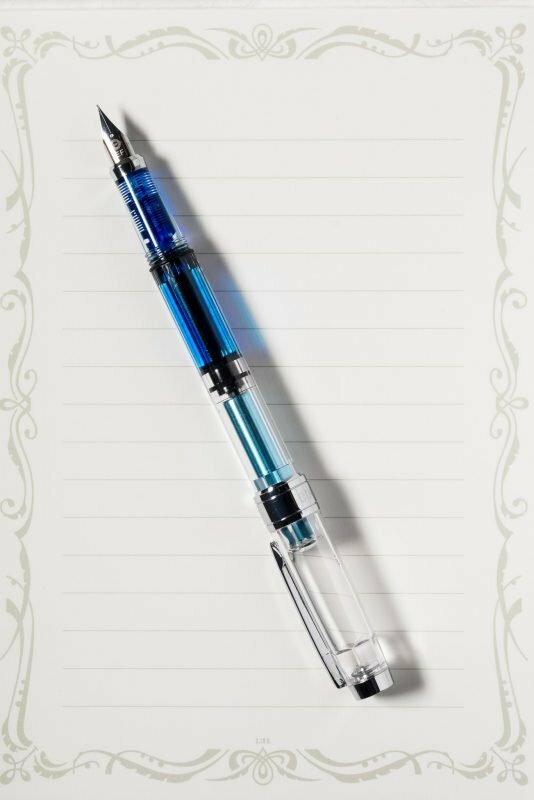 Chances are that one of the reasons you use a fountain pen is for the writing experience, so choosing a paper that will enhance, not detract from that experience should be a priority. Similarly, if you are taking the time to write something that another person will read, you should want them to have a good experience as well. The type of paper that you enjoy writing on will vary from person to person. Some people want a very smooth paper that offers little to no resistance and provides a very smooth writing experience. Other people want a little feedback when they write. For some, the sustainability of the source material might be of utmost importance, so choosing a quality paper with higher cotton content or one that’s made out of a material like bamboo or sugarcane might enhance their writing experience. Finally, some people might not enjoy a blank piece of paper and instead prefer writing on paper with some sort of design or adornment. Regardless of which of these will enhance your writing experience, there are many different paper options out there to choose from. You’ll also want to keep in mind the experience that your reader is going to have. A thicker, heavier paper can make your writing seem more substantial and permanent. A beautiful design on a piece of paper can definitely add visual interest to a letter. Even the color or texture of a piece of paper can influence how much a person enjoys their reading experience. This Life paper has a nice pattern on it, which is much more interesting than a plain piece of paper. While you might know what features you want your paper to have, chances are you’ll have to pay a premium for some of them. Some of the smoothest papers that show the most sheen will cost significantly more than other, more basic papers. Similarly, heavier papers or those with printed patterns will likely cost more than lightweight or plain papers. For example, you can get a basic but decent quality notebook for under $10, while a premium quality notebook might cost nearly twice as much. The same goes for writing paper. Basic, fountain pen friendly copy paper costs pennies per sheet, while high quality writing paper can cost over $0.40 per sheet. While the cost per sheet might not seem like much compared to the cost of a fountain pen, it is still an expense to keep in mind. As I’m sure you have already guessed, the ideal paper for you might not be ideal for someone else. Everyone has different requirements for which paper qualities are going to work the best for them. Still, I feel like I should make some recommendations for a few different paper styles. One of the most popular papers amongst fountain pen users is Tomoe River. If you have an ink with sheen, it will bring it out more than almost any other paper available. With that being said, it’s not my favorite writing paper. It is thin and has almost a “hard” feel to it. I have also been on the receiving end of many letters written on Tomoe River and have to say that they don’t feel nearly as nice to read as letters written on more substantial paper. So what do I recommend? If you want an ultra-smooth writing experience, I would recommend Clairfontaine Triomphe. It is an extremely smooth paper that also happens to showcase all of an ink’s many fine features. If you want a little more feedback when you write, Life Bank Paper makes a wonderful writing paper. You can read my full review of it here. 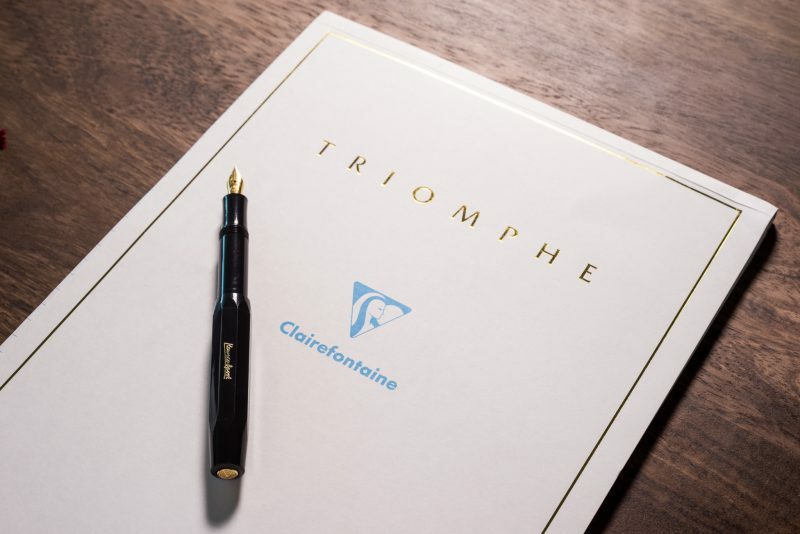 Clairfontaine Triomphe is a luxurious stationary that is wonderful to write on. Having a notebook that gives you a luxurious writing experience is something that all fountain pen users should have. Fortunately, there are many options to choose from. If you want a notebook with smooth paper that your pen will glide across that will also show off your favorite inks, Life Noble Notebooks are some of the best around. If you’d prefer a notebook with a little more feedback, the Midori MD notebooks are wonderful to write in. Life Noble Notebooks are some of the best around. It’s no secret that I love the Fabriano EcoQua notebooks. They are high quality and reasonably priced. As for their features, they do show both shading and sheen, are resistant to feathering and bleeding, have a bit of texture that offers feedback when writing and come in a big variety of sizes and colors. I use one of these notebooks when I go to pen meetings and feel that it works well with any inks and pens I happen to try out. These Fabriano EcoQua notebooks are one of the best values around and are great for fountain pens! Interested in trying some of these papers before buying a notebook? Head over to my shop and pick up a paper sample pack. 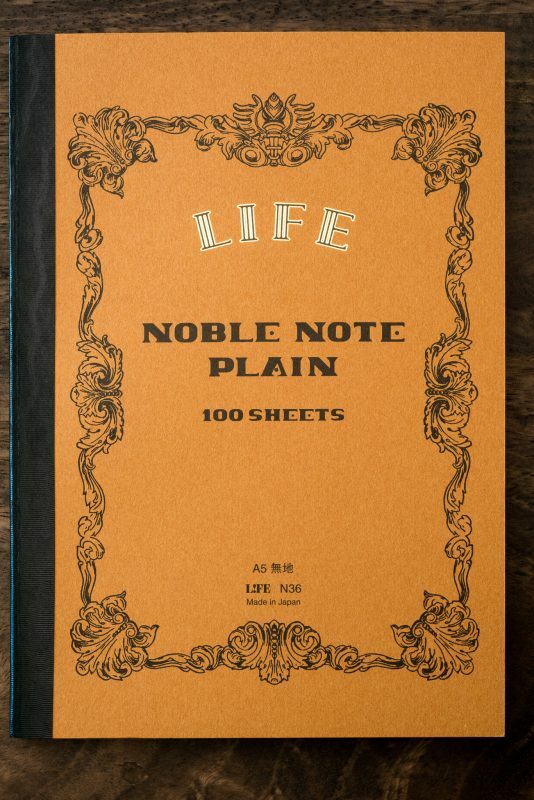 Looking forward to try Life Noble Notebooks <3 Thanks! I hope you love it as much as I do! Enjoy! So far I have used Clairefontaine, Leuchtturm, Rhodia, cheap composition books from Office Depot, and a journal filler I got from Oberon Design. The one from Oberon bleeds and feathers the worst of the lot. I’m looking forward to receiving a Tomoe River journal I’ve ordered, as I’ve heard really good things about their paper. I bet you’ll love the Tomoe River journal. Just be prepared for slightly longer dry times than you’re used to, but it handles ink like no other paper. Enjoy! Good read and glad to see a review on these popular paper brands. Tomoe River is a fave but I’m looking into that Fabriano. Cheers! I’d agree that Tomoe River is a fave, but it’s always nice to have something a little less expensive to use. 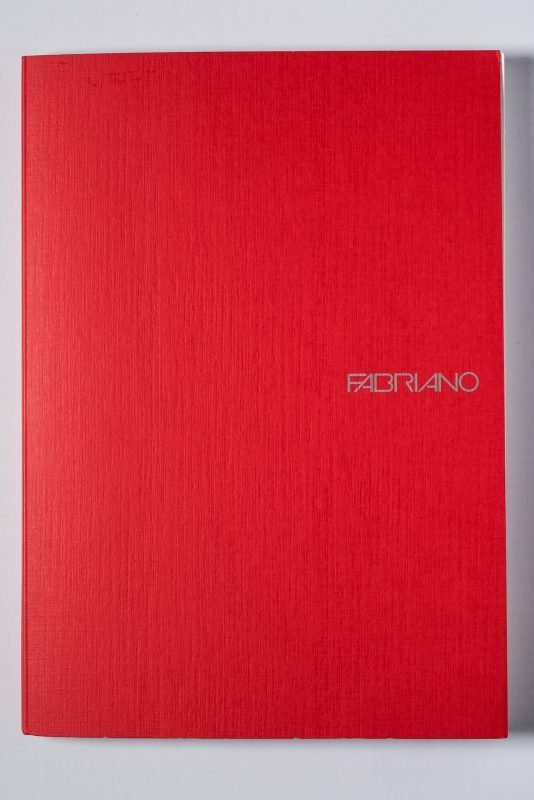 Hope you enjoy the Fabriano!